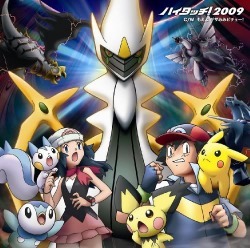 Arceus jewel of life the movie starts with a flash back to where arceus is betrayed by man (damios). theflash back shows a man tricking arceus and making him sleep, title secene. after we see ash and his freinds coming up to the city fetured in this movie. they battle some trainers who know where the ruins are, they go to the ruins to encounter DIALGA. ARCEUS is creating wirlpools to show he is awakening and GIRATINA comes as DIALGA is fighting the wirlpools. they calm down after awhile and all disapear. after they go Areus comes to the town firing jugment into the air, demanding for the jewel of life. ash and his freinds are with guardians of the ruins who clame they have the jewel. arceus sees the fake and goes in a terrible rage destroying alot of the ruins when palkia and dialga appear. arceus is raged that dialga and palkia are protecting humans and atacks them. giratina soon comes along and protects the two fighting legandary pokemon in defeting arceus. After dialga is weakend he sends ash and his friends back to the time when arceus's rage started. Ash see's that arceus was betrayed and it was done by a man who everyone in the future thinks did it all. Dialga sends them back further into time where ash and his friends are captured and put in jail, the ruin guardian tries to tell the man that captured him they came from the future. the man gets ideas and plans to do what might not have happened if ash had never gone back. in the jail ash and co meet up with the man who betrayed arceus. he explans he never planed on betraying arceus. it is then the reolise that he was hypnotised into doing it.